The Destination expects 500 kids ready to enjoy this free friendly tournament held at the Marina Riviera Nayarit. 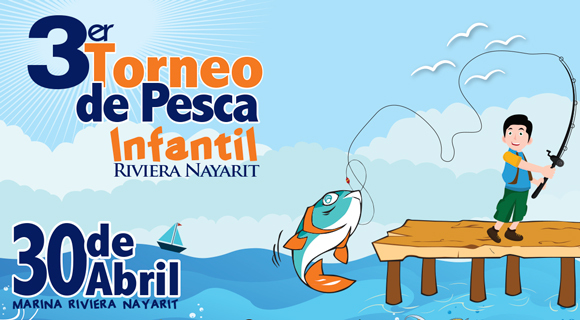 The Marina Riviera Nayarit in La Cruz de Huanacaxtle and the Riviera Nayarit Convention and Visitors Bureau is ready to welcome the 3rd Annual Riviera Nayarit Children’s Fishing Tournament on Sunday 30 April, 2017, with the full support of the Banderas Bay Fishing Club. 500 kids will be welcomed from 8 a.m. through 11 a.m. to take advantage of this free friendly competition, which encourages sport fishing and environmental awareness in a family atmosphere. The kids will fish off the pier, with the only requirement being that each one be accompanied by an adult. All children will receive a free commemorative t-shirt, a ball, a bag of candy, food and beverage. The competition will have only one category from 3 to 12 years of age. The top 10 catches will enjoy special prizes on behalf of the sponsors, including bicycles, board games, fishing gear and more. The fish will be returned to the water once they’re weighed to encourage conservation and environmental awareness. The Riviera Nayarit CVB would like to thank the municipal and state authorities, as well as the staff at the Marina Riviera Nayarit for their help. For more information please call 01 (322) 222 54 67.